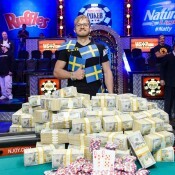 The 2006 WSOP has its first event winner! 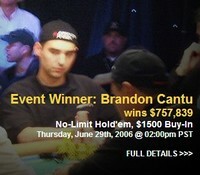 Brandon Cantu has won the 2006 WSOP’s first [real] title by bagging Event #2 ($1,500 NLH). This is Cantu’s first major tournament cashing, and let’s just assume that he’s swimming in all that money you see right about now in his newly upgraded hotel suite. And trust us, what Brandon is feeling at this moment is hard to top. Big king-sized bed, money sprawled out in a sea of green, three beautiful Asian women wearing nothing but baby oil squirming around in it. It’s a feeling everyone must experience at least once. Brandon Cantu, enjoy it while you can. However, there is a greater question than how Brandon Cantu is enjoying his newly acquired $757,839. And that question is this: Can anyone at Poker Pages take a damn photo that doesn’t look like the photographer was smacked upside the head with a mallet when the lens snapped? (Evidence at left) Do they use a camera that has a "Blur Only" feature? We could hold a camera in our mouth while shivering from hypothermia and take clearer snaps then this. Brandon Cantu bested Mark Ly heads-up for the title. Ly will take home $416,816. 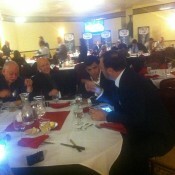 The big name pro at the final table, Carlos Mortensen, was the first to go. 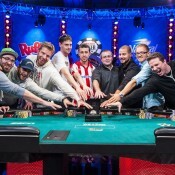 See how much richer Mortensen and the rest of the final table got over at Card Player. Also, Event # 3 ($1,500 PLH) will wrap later today, and we’ll throw all journalistic integrity out the window by saying we’d really like to see Tiltboy Rafe Furst pull this one out. Rafe, who sits third overall with 222,000, will have to deal with the likes of John Juanda (147,000), Burt Boutin (140,000), Day 1 chip leader Can Kim Hua (122,000), and current chip leader Eric Lynch (455,000), among others. But it could happen today. Final table play kicks off at 2pm PST. Check Card Player and Poker Wire for the updates. * Photos from Card Player and Poker Pages, respectively.